Iceland captain Aron Einar Gunnarsson admits he will not watch the video of Neil Taylor's horror tackle on Seamus Coleman which left the Republic of Ireland captain with a fractured leg on Friday night. Gunnarsson, who plays in midfield for Championship side Cardiff City, sent his good wishes for a speedy recovery to Coleman. "No, I didn't see the video. I have just seen a picture of it," he said. "It was horrible, and I wish him all the best for his recovery. It's always a shame when you see a player getting injured like that. "I wish him all the best, but I didn't want to watch the video. It was horrendous for him." Gunnarsson knows Coleman's replacement Cyrus Christie and centre-back Richard Keogh from the trio's Coventry City days. "I've played with Keogh, and Christie as well," he said. "Christie is a strong, physical player. He does his job, and while he's been in and out for Derby through injury, I think he will add fighting spirit to the squad." While Ireland fought out a draw against Wales on Friday, Iceland grabbed a great away win, defeating Kosovo 2-1 in Group I to stay in second place, three points behind Croatia. Coach Heimir Hallgrimsson will select his team tonight without three of the midfielders who started against Kosovo - Swansea's Gylfi Sigurdsson, Emil Hallfredsson of Udinese and Arnor Ingvi Traustason (Rapid Vienna). Halgrimsson will mix senior players with some less experienced players, but despite the 'friendly' label on the fixture, he expects a tough, competitive match - because he reckons the Irish don't know how to stroll through a game. "Knowing the Irish, I wouldn't think so. We know it's going to be a really tough game. It's definitely going to be battles everywhere but I hope the players will go carefully in what they do," he said. The manager admits there has been some "hangover" from France 2016, which was Iceland's debut in a major finals. Players did not get their usual summer break, and their limited squad has suffered a number of injuries. Hallgrimsson has not been able to field the same team twice so far, but his side has ten points from five matches in Group I. "It's a little bit of a hangover of course," he said. "It's the first time for the players that they didn't get their summer holidays, so everything is new, but now we want to qualify for the World Cup." 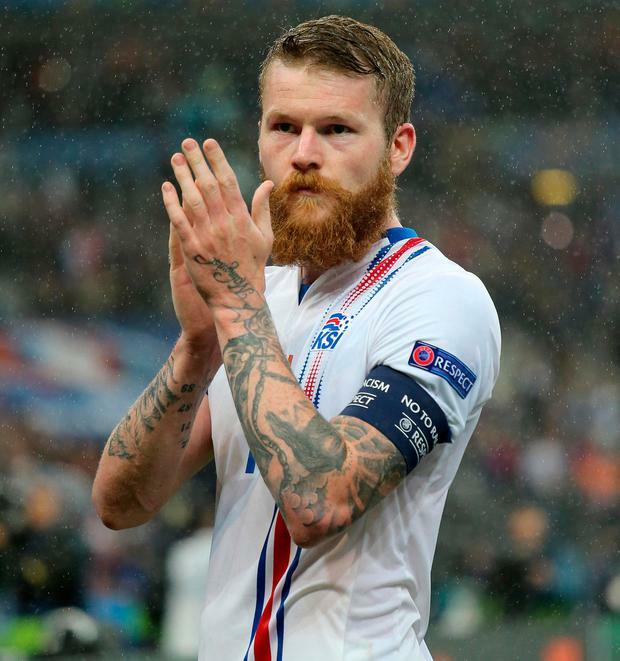 Iceland became everybody's favourite 'other' team at Euro 2016, not least for the magnificent 'Viking clap' that thundered around the stadia at their matches in France. We can expect more of the same from both sets of fans tonight. B Sigurdarson (Molde), Bodvarsson (Wolves).